Pros: Shot Selection: Wooded holes are creative, some are twisting and turning, some tunnel shots, others are shorter Ace runs. Open holes are more distance shots, looks like some trees are planted for future shot shaping needs. Dual pin positions, almost every Hole has two Tee areas, a few shared. #17 offers an island Hole as well. Course plays away from other activities, not going to find people wandering through for the most part. Has a bit of elevation, nothing dramatic, but not totally flat either. Shelter near the start of the course with picnic tables. Cons: Currently, no cement pads, utilizing the astro-turf style. Would anticipate cement being laid down in the future. Tee signs are a combo of some old original signage, with some newer, yet worn metal signs, a couple Holes missing any kind of sign, also anticipate probably all new down the road. Hole #10 could be rendered unplayable if the nearby Baseball field is in use, the hill the basket is set upon looks like a prime viewing area for the baseball fans. Baskets aren't numbered, but that will be taken care of in the future surely. Little confusing walking to #12, map shows a long Tee placement way down by the parking lot, once I walked there, it didn't seem like the appropriate spot, found a pad closer to the tennis courts that may have been the actual Tee location. Nearby school generator a bit noisy, but you end up playing away from it in short order. Other Thoughts: The Course is a full 18 holes now, and the local Club is putting in a ton of work! Really clearing the wooded areas nicely, and you can see the labor of love that has already been put in. The long #1 Tee is right next to the road you enter on, and it makes for a really challenging start, tough Hole. Really good Rec-Intermediate course, the wooded holes more like 3 stars, and open would be currently about 2.5, but for where it is and where you can see it going, definitely 3 solid stars, could rise as time goes on. Pros: Edit 5/15/16: Looks like they have the 18 ready, so keep in mind the following info is for the 9 holes that existed in 2015. Assuming you go to the first tee behind the tennis courts (and not to the area proposed on the 18 hole course map: it's not ready yet...), this nine hole course flows very simply in and out through the edge of the woods past the Elletsville school sports fields, and shares some space with the flagged cross country trails. There is really very little conflict with other activities, and the fairways and basket areas seem to be pretty well maintained. Decent, basic signage (hole number, distance and direction) points your way from short and long tees to bold, red, spiderweb baskets, with their deep cages and three sets of chains. 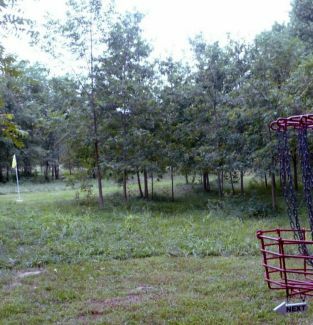 You'll start off with the challenge of clearing a 270 foot field into a woods gap with the first basket about 45 feet further in, which makes for a pretty nice starter hole. Then the big arms can crank one to the middle of the clearing on 2 before having an even trickier woods entry shot on 3. One bending to the right in the woods later (hole 4), you emerge out on 5 and fade to the left and in again on 6, before you get to shoot the challenging tunnel out to open hole 7. 8 and 9 were likely pretty dull, open field shots before all the small trees started to grow in and force the choice of lines they do today. In all, Edgewood is a good sampler of control and distance lines. But the local club is clearly working on making this an even more varied course, with clearing being done in the woods for some challenging, shorter holes, as well. Might be worth a revisit in the future to see what they make of it. Meanwhile, it's a pretty fun nine, provided you know it's in transition. Cons: The long tees on the current course basically just extend most shots 30 to 60 feet, rather than aiming for a different line. That's not to say that the shots aren't a LOT harder, such as getting out of the tunnel clean on hole 7 and still swinging to the right once you get your disc out to the open! Though the course appears to be getting some play, the summer foliage looks like it has grown in a bit to make some tee shots and the entries to the greens really tricky (I'm talking to you, holes 3, 6 & 9). Being a course that definitely runs in conjunction with some of the cross country trails, as they complete the expansion and upgrades to make this an 18 hole course, I doubt concrete tees are in the works, but I could be wrong. For now, we're looking at natural tees with toe boards. Not too much elevation to make these slick, though (but that also is a 'con' - they didn't have much elevation to work with, so the best they could do was to place baskets 7 & 9 on the soccer field hillside, and offer one bomber tee off the top on hole 8 long. Other Thoughts: Having visited the area at the end of August to play all of the Bloomington courses, I took pictures and posted a map for this nine hole layout here on DGCR.